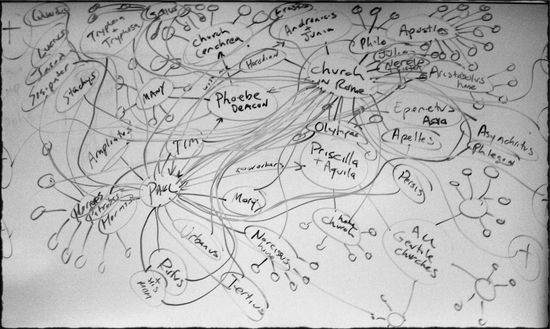 The latest whiteboard scribbling… another rendition of the Romans 16 network… done in Youth & Family ministry class at Crown today. Paul never considered ministry the job of a loner. He considered others to be in partnership with himself… and he depended on others and was thankful for others who practiced ministry. Paul understood that without him ministry would still be accomplished. In the writing, sending and hearing of the letter-book of Romans… there was partnership between people of varying ethnicity, gender, experience, age, nationality, economic status, and social position. Yes we should Steve!! I’ve thought about this many times… writing a Romans 16 version of our personal networks of ministry… N.Ireland, Canada, U.S., etc. What a hub of interconnection that would be!! Beautiful! We should do one sometime!